Fischer Connectors continues to make its customers’ life easier. 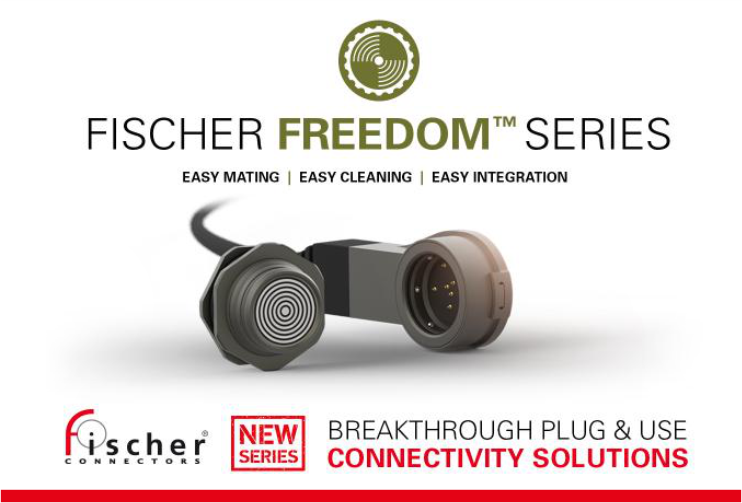 Available as of 11 June 2018, the Fischer Freedom™ Series offers breakthrough plug & use connectivity solutions that are easy to use and integrate. These innovative solutions meet design engineers’ urgent needs for designing and connecting portable and body-worn applications quickly and easily – e.g. cameras, radio systems, sensors, light, GPS, tablets, night-vision goggles, exoskeletons, as well as switches, hubs and batteries. Thanks to its innovative features, the Fischer Freedom™ Series facilitates integration, maximizes usability and optimizes cable management for a wide variety of applications within markets such as: defense, security, medical, industrial and civil engineering – just to name a few. Breakthrough 360° mating freedom enables the Fischer LP360™ to be plugged and routed in any direction, so the cable can always go straight to the device – no more twists and turns! It is also possible to opt for cable-free solutions by integrating the plug directly into the device’s housing. The Fischer Freedom™ Series enables design engineers to build an intelligent vest which works as a hub with multiple portable and body-worn devices connected to a shared data and power bus. Clutter is reduced and usability increased, making your customers’ equipment lighter and faster to set up. These benefits also open up further opportunities in the Internet of Things (IoT).